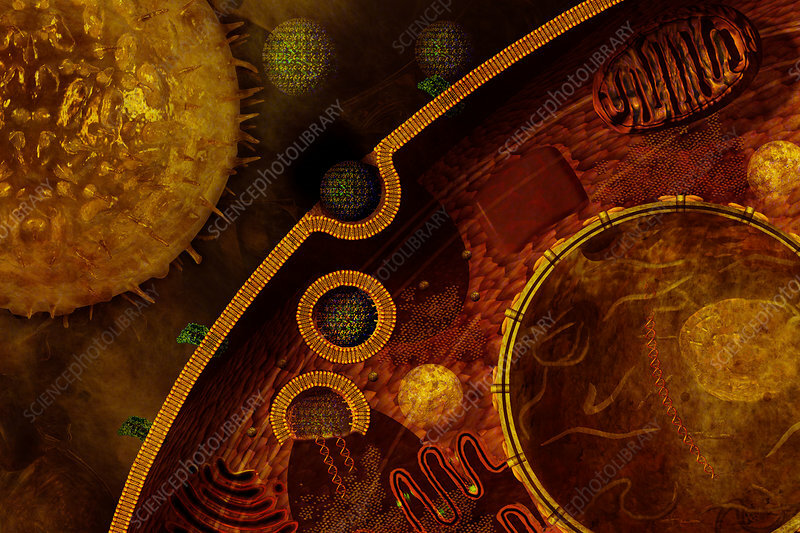 Illustration depicting Cytomegalovirus (CMV) infecting a cell. CMV is able to utilize a key immune system trigger protein to evade immune cells such as the natural killer cell. One of the herpesviruses, CMV is a common infection that is usually harmless, although once it is present in a person's body, it stays there for life and may activate at any time. In the United States 50 - 80% of adults are infected with CMV by the time they are 40 years old. Most show no symptoms and never know they are infected. However, CMV can be dangerous for infants and children, causing hearing loss, blindness and developmental problems. Researchers are at an early stage of developing a vaccine which disables the above-mentioned protein in the virus, thus enabling the body's immune cells to destroy it. For a labelled version, see image #BZ4277.